You may have seen on instagram that my in-laws are visiting this week. 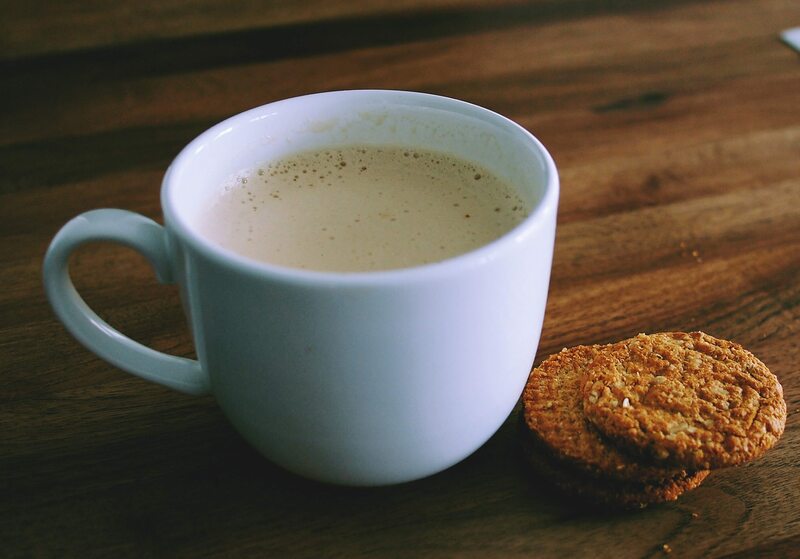 While my mother-in-law is always creating the most amazing dishes for us to eat, her one culinary request for me is to make her my blackstrap molasses latte – it is her absolute favorite! Blackstrap molasses is a sweetener that is chock full of vitamins and minerals. It comes from the third boiling in the refining process that turns sugar cane into table sugar. It contains iron, b6, magnesium, calcium, manganese, and selenium, and these nutrients are very helpful for hormone balancing, acne, eczema, fibroids, and endometriosis. I often suggest to my female clients that they take 1 teaspoon to 1 Tablespoon every day if they are nutrient deficient. If they suffer from heavy bleeding, they often increase their blackstrap molasses to close to 2 Tablespoons per day. Not everyone likes to eat blackstrap molasses off the spoon so I am sharing this easy recipe for a blackstrap molasses latte. If you’re not a coffee drinker, you can just as easily make this with tea as well. This latte also contains coconut oil, which adds a creamy frothiness when the latte is blended up. Coconut oil is fantastic for improving metabolism, increasing energy, balancing blood sugar, and boosting the immune system. Blend together in a high speed blender or by using an immersion blender until mixed and frothy. Enjoy! Have you ever used Blackstrap Molasses? This is so interesting, I can’t wait to try! I made this and it is so so good! Seriously, you should bottle and sell this. I will totally try this. I live with coffee and I work with coffee. I’ll let you know if I like it then..
Wow, this sounds so good and easy to make. I’m definitely trying this, yum! Wow this looks great! I’ve never heard of Blackstrap molasses but I’m going to order some on amazon and try it out. Perfect timing! I’ve been looking for a new winter health beverage. My apple cider vinegar tonics have been getting old. I’ve heard amazing things about coconut oil! Can’t wait to try. This sounds great, I want to try! Sounds good! I can not wait to try it out! Hi from the LG Mastermind group! I’ve heard of blackstrap molasses, but have never experimented with it. This makes me want to try! So interesting! I’ll have to try this out. OMG this looks absolutely delish. I can’t wait to try!